The European Union (EU) today (Feb 11) commenced the formal process to strip Cambodia of preferential tariff subsidies provided under the Everything But Arms (EBA) trade scheme. Union leaders have expressed their regret over Sam Rainsy asking the EU to withdraw the Everything But Arms (EBA) preferential agreement from Cambodia as it is the workers who will be severely affected. Larry Sng Wei Shien, Malaysian parliamentarian, announced that Air Asia is willing to cover the cost of flying all 47 Malaysians currently detained in Poipet, back home. Efforts to secure the immediate release of 47 Malaysians currently detained in Banteay Meanchey in Cambodia are underway. The EU has today started the process that could lead to the temporary suspension of Cambodia’s preferential access to the EU market under the Everything But Arms (EBA) trade scheme, according to the European Commission’s press release dated 11 February 2019. Leave it to the Malaysian authorities to negotiate the release of the 47 Malaysians arrested and jailed in Cambodia, said state Welfare, Community Wellbeing, Women, Family and Childhood Development Minister Datuk Sri Fatimah Abdullah. Cambodia’s education ministry has instructed schools to prevent “unusual activities” during Valentine’s Day, saying the event was not a “traditional holiday” in Cambodia. The Ministry of Education, Youth and Sport has issued guidance to all public and private learning institutions to teach students the true meaning of Valentine’s Day, an outside cultural event relatively new to Cambodia. Wielding handmade bamboo baskets and nylon nets, hundreds of people waded thigh-deep into a muddy lake in eastern Cambodia on Sunday (Feb 10) for an annual fish-catching ceremony where only traditional tools are used. Six Ministry of Environment officials, along with government representatives and young people from Laos, Myanmar, Thailand and Vietnam, will conduct a nine-day Japan visit from Monday as part of the Japan-East Asia Network of Exchange for Students and Youth – Jenesys – project, under the theme “Improvement of the atmospheric environment”. A Cambodian delegation has attended the International Travel Trade Expo (ITTE) in Manila, the Philippines to promote the Cambodian potential and attracting tourism in the Philippine market. Cambodia Post, the agency responsible for providing postal services in the Kingdom, increased its revenue by more than 50 percent last year, surpassing $13 million, according to the agency’s latest report. It is lunchtime at a coffee shop in Kandal province’s Takhmao city. Customers enjoy a cuppa while chatting effusively with friends. Behind the counter, Sokun Thoeun, the owner, checks their payments on his smartphone. The Phnom Penh Municipal Hall is set to beautify public sidewalks along Russian Federation Boulevard, including relaying tactile paving to support the mobilisation of the disabled. Cambodia will host the 12th Cambodia-Laos-Viet Nam (CLV) Development Triangle Joint Coordination Committee Meeting and its related Meetings in March. 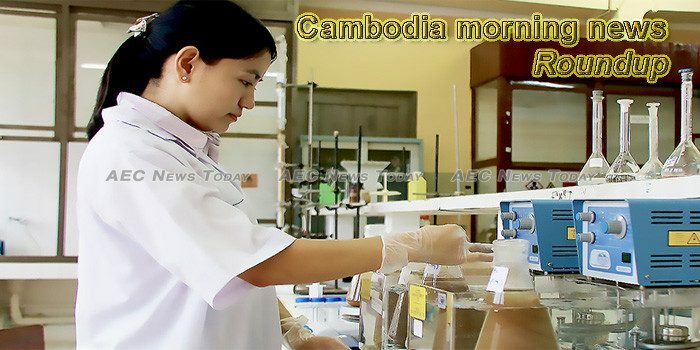 This week’s Cambodia morning news feature photo acknowledges International Day of Women and Girls in Science, February 11.